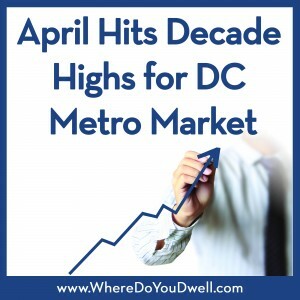 April showered the DC metro area with market stats that should bring sunny and optimistic smiles to most buyers and sellers! The region saw some decade high levels for prices, closed sales, and new contracts for the month of April. These recent statistics show how the local housing market is more robust and steadily improving with most sellers getting solid prices for their homes, and most buyers getting properties that have regained their value. There also seems to be no sign of the snow-related slowdown from earlier in the year. Median sales price of $419,250 was the highest April level in a decade and was up $2,250 (+0.5%) compared to last year, and up $20,250 (+5.1%) from last month. Closed sales were up 9.6% compared to last year and were at a new decade high for the month. This was the 17th consecutive month of year-over-year increases in closed sales. New contracts increased by 7.2% to 6,647, an all-time high for the decade. 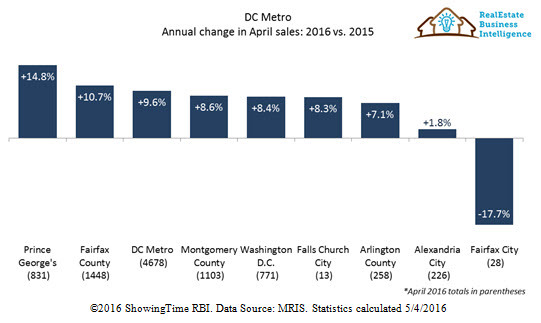 New listings were up 1.1% year-over-year to 8,809, the highest April level since 2010. Active inventories rose 2.3% compared to April 2015 to 11,113. Active inventories have been increasing year-over-year since October 2013. The average percent of original list price received at sale in April was 98.0%. Half the homes sold in April were on market 14 days or less. 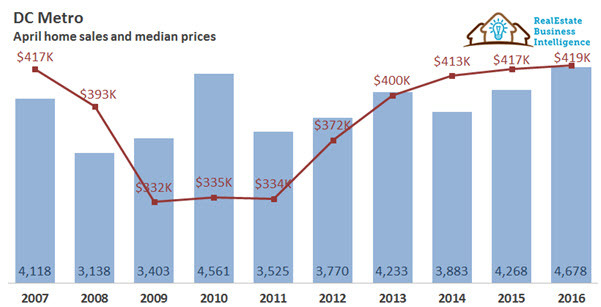 Home Prices – Prices reached a new 10-year peak of $419,250 – that’s 26.3% above the April 2009 price. April’s regional median sales price rose to $419,250, a slight 0.5% over last year’s $417,000. Single-family detached prices rose 0.8% to $524,000, townhome prices rose 1.2% to $410,000, but condo prices were down 0.8% to $302,500. Prices are 3.8% above the 5-year average of $404,050 and 9.4% above the 10-year average of $383,125. 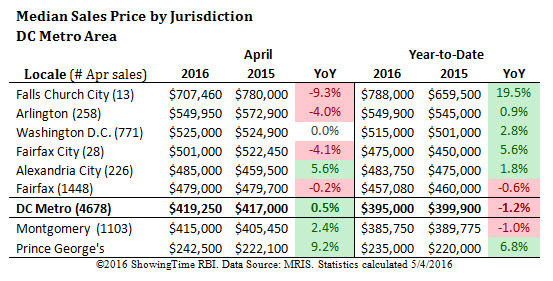 Sales Price by Jurisdiction — Prince George’s County continues to be the most affordable area in the region with an April median sales price of $242,500, (up 9.2% from last April). Closed Sales – Closed sales of 4,678 set a new April decade high, exceeding the previous 2010 high of 4,561 by 2.6%. The 4,678 closed sales in April were up 9.6% compared to last year’s 4,268 and up 24.6% compared to last month’s 3,755, marking the 17th month in a row of increased Y-o-Y sales. Single-family detached sales were up 13.9% to 2,206, while condo sales were up 10% to 1,315, and townhome sales were up 1.8% to 1,155. Closed sales are 12.3% above the 5-year average of 4,166, and 18.2% above the 10-year average of 3,958. Sales were up 49.1% compared to the market low of 3,138 seen in 2008. New Pending Sales –New pending sales number of 6,647 surpassed the April 2015 high of 6,203 by 7.2% and was 70.6% above the April 2008 low of 3,896. All property types again saw increases in the number of new contracts compared to last year, with single-family detached up 9.3% to 3,327, condos up 8.9% to 1,646 and townhomes up 1.5% to 1,673. Pending contracts were above both the 5-year average of 6,066 and the 10-year average of 5,448. New Listing Activity – The April new listing total of 8,809 was the highest monthly listing total since April of 2010. New listings for townhomes rose 3.7% to 2,071, single-family detached rose 0.4% to 4,583 and condos rose 0.2% to 2,150. New listings in April were above the 5-year average of 7,677 and the 10-year average of 7,933.  The April new listings are 40.3% above the 10-year low of 6,280 seen in April 2012 and are only 7% off the April 2007 market peak of 9,477. 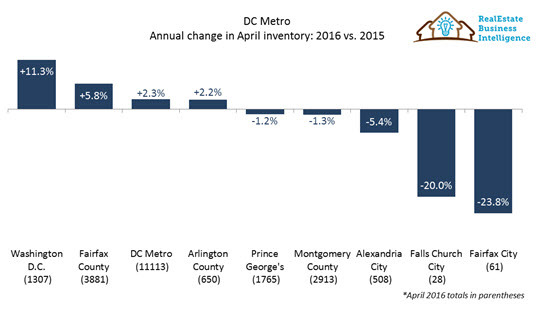 Inventories –The District saw the largest increase in inventory of 11.3%, with 1,307 active listings. Inventories increased 2.3% to 11,113 at the end of April. ll property types show an increase over last year, with townhome inventories up 5.8% to 1,978; condos up 2.3% to 2,926; and single-family detached up 1.3% to 6,198. Inventories are 14.3% above the 5-year average of 9,725, but 23.7% below the 10-year average of 14,573. Average Sales Price to Original List Price Ratio (SP/OLP) — Over the last decade, the region’s April average SP/OLP ranged from a low of 91.3% in 2009 to a high of 98.3% in 2014. The regional SP/OLP ratio for April was 98.0%, down just slightly from last year’s 98.2% and up from last month’s 97.1%. 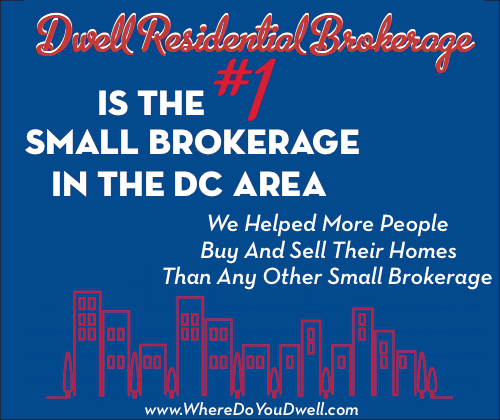 Homes in the District sold at 99% of their original listing price in April, the highest in the region and down slightly from the 99.6% seen last year. The largest gap between original listing price and sales price was in Montgomery County, where the average ratio was 97.3%, down slightly from the 97.6% seen last year. Days-on-Market (DOM) – Median DOM of 14 days is below the 5-year average of 15 days and the 10-year average of 28 days. Both condos and single-family detached homes had a median DOM of 16, while townhomes had a median DOM of 10. The highest median DOM is in Prince George’s County, where it is 25 days (down from 26 days last year). The lowest median DOM are in Alexandria City, where it is 10 days (down from 16 last year) and in the District, where it is also 10 days (up from 8 days last year).